Last week got postponed, to this week. We laid down some particularly shoddy drums (me), and some decent vocals (Simon). Digital editing technology will be our friend. 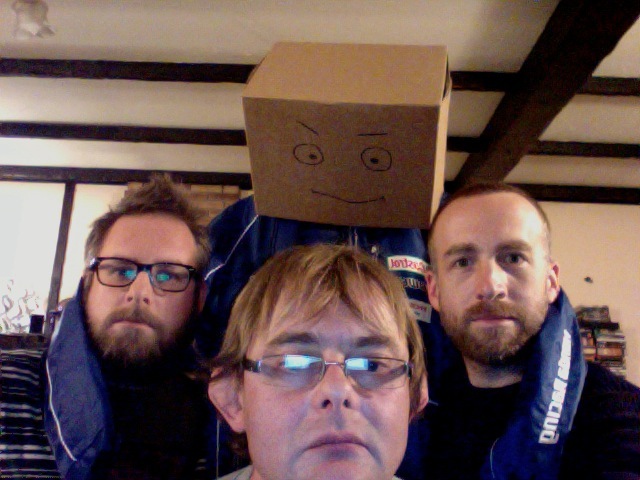 Stumpy Boxhead himself joined us in the studio for a few of the tracks. Pete videod lots of soft toys. Jessie the dog lost her blanket (temporarily). Rob defined exactly what was and what wasn’t Rock and Roll. Simon drank lots of water. Things are really taking shape now. Next week we should (adding to the list of what is Rock and Roll) be recording some guitars again. This entry was posted in Flesh Reunion and tagged boxhead, drums, Flesh Reunion, Flesh Reunion 13, Flesh Reunion 13b, HMD, HowManyDevils, Pete, Rob, Rock and Roll, Simon, singing, Stumpy Boxhead, vocals. Bookmark the permalink.